Two talented filmmakers are teaming up to make a documentary about shelters and – you’ve guessed it! They have selected World Shelters as one of their subjects. The SHELTER movie is being co-produced by Lee Schneider (of DocuCinema) and Richard Neill (of Adventure Pictures), extraordinary documentary filmmakers who have won numerous awards and whose work has been featured on National Geographic, PBS, and the Discovery Channel. 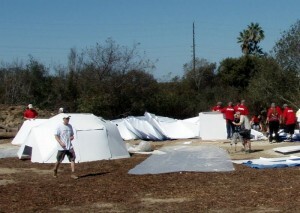 The duo was in Ventura on Sept. 26, filming hundreds of volunteers assemble U-Domes for the United Way Day of Caring. Lee Schneider from DocuCinema films the SHELTER movie at the United Way 20th annual Day of Caring event assembling structures in Ventura’s River Haven community on Sept. 26, 2009. Read the SHELTER movie blog for current production news – it will later feature videos, trailers, and notices about invitation-only screenings. We are excited to be featured in SHELTER. It was great to have them on site in Ventura and we look forward to having them follow our next shelter projects.